Here is a 15 x 15 diamond shaped blank wordsearch puzzle sheet to support kids' creativity in and out of the classroom. Students love using these blank word search sheets to make word searches with the many words that they love. Teachers and home schoolers can include these blank puzzle sheets in their everyday classrooms to support vocabulary building and engage problem solving strategies. Next, have students exchange their newly created word searches with classmates and maybe reading buddies and then solve. 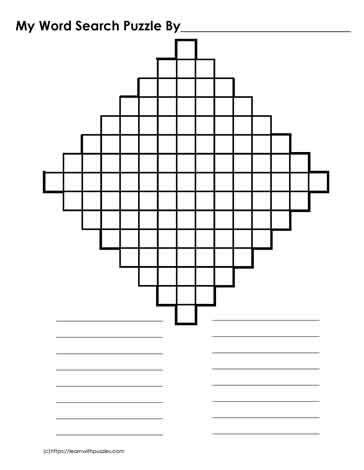 There is a 17 x 17 diamond shape blank puzzle sheet and a 21 x 21 diamond blank wordsearch sheet.